Please enter a value within the limits shown below. A premium door system, with a whisper quiet running action. The running gear is integrated into the frame. Mirror is held in place with silicon gaskets. Rust free, ideal for use in humid environment such as kitchens and bathrooms. The Deluxe Pack contains some extras which make your wardrobe doors that little bit more luxurious. With soft close and buffer strips, they really are worth having. 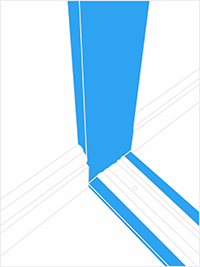 Soft closers to the outer doors ensure that the door closes softly to its end position. The soft closer features an air damper, which guarantees durability and performance stability throughout its useful life. 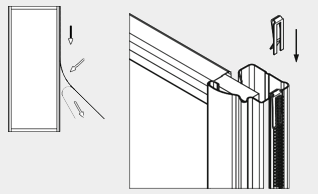 A soft self adhesive bristle strip designed to dampen door impact against neighbouring doors and the wall, preventing slamming. It also and eliminates minor wall irregularities. A Floor/Wall liner is used to provide a neat professional finish to your sliding door wardrobes. They are also useful for dealing with any irregularities in walls and can be packed to level up the floor if required. NB Please ensure you allow for the wall/floor liners in your measurements provided. Will require cutting to size. 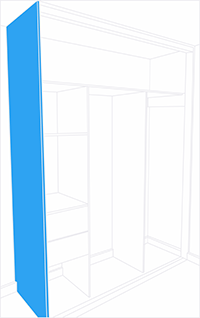 If your fitted bedroom wardrobe is not going wall to wall, you can use and 1 or 2 end panels to make an artificial end. Sorry, that postcode was not recognised.